"The signature deadline has been reached for this petition". Signed & Noted! Good grief...What next? An completely androgynous world. Noted as for shopping or donating I'd love to but can't, thank you! I know I signed this one as I get email alerts from Save the Frogs. I have also signed a lot of other petitions from various orgs to ban atrazine and all the other poisons. The signature deadline has been reached for this petition. Thanks for your interest! Signed and noted without any issues or deadline being reached. Thanks Nancy! Unfortunately, the signature deadline has been reached, but there is certainly a wealth of resources available on the site Nancy provided! Unfortunately deadline for signing has been reached, Thanks for sharing Nancy. Signed and signature went through without any problems noted. Noted, tweeted, previously signed, and commented. We live in a world of science; sometimes, it is scary the harm we can do. A healthy frog population is a positive sign that you have healthy wetlands. Wetlands are another way the planet regulates a healthy environment. Rainforests and coral reefs are certainly important but so are the wetlands. Without frogs much as with honey bees you are in trouble if you don't have a healthy population. 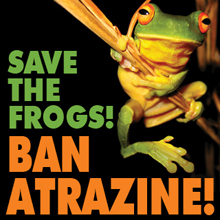 Save the frogs, ban Atrazine! "The signature deadline has been reached for this petition. Thanks for your interest!" Noted, but sadly too late to sign. Already ahve signed this one, thanks! Signature deadline has been reached. Too bad - I would gladly have signed this one. Noted. I could have signed before, don't remember. Noted and signed Nancy :-0 Thnx..